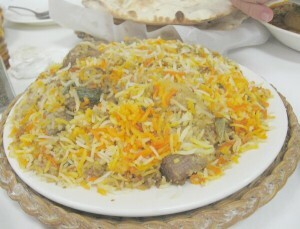 Nawabi Biryani recipe by Nazia Nazar. Fry the dry fruits & apricots in 2 1/2 tbsp gheeClick to find more about ghee with a little saltClick to find more about salt to taste. Grind the fried onions and red chilies to a fine paste. Marinate the mutton pieces with curd, gingergarlic paste, onionClick to find more about onion paste, turmericClick to find more about turmeric powder and saltClick to find more about salt. In a pressure cooker heat gheeClick to find more about ghee, add the marinated mutton and pressure cook till done. Heat gheeClick to find more about ghee again in another vessel, add the whole spices, fry for a while and then add the washed rice. Add saltClick to find more about salt, warm water so that comes 1 1/2 inch above the rice and cook till the rice is done. Remove, spread out to cool and remove the whole spices. Now to assemble, apply gheeClick to find more about ghee to a heavy bottomed vessel, add the cooked mutton and sprinkle little garam masala. Cover with a layer of rice, followed by a melted gheeClick to find more about ghee and then the saffron milk. Finally, add the fried nuts, cover tightly and keep on dum for 1520 minutes. Mix and serve hot garnished with chopped coriander & pudina.